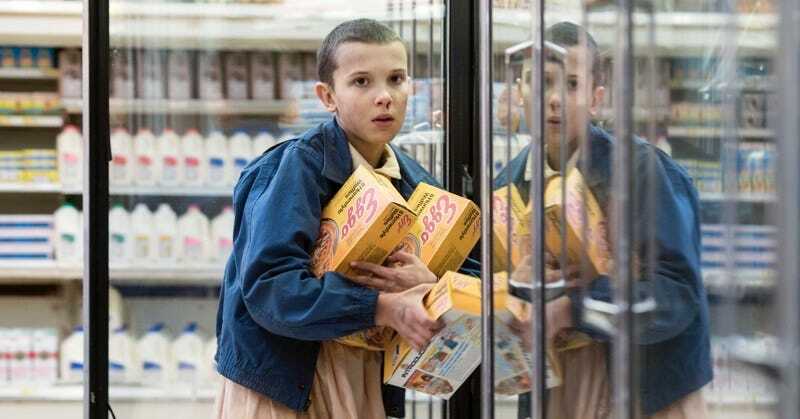 Stranger Things hit Netflix in mid-July and has since become a pop culture phenomenon, spawning breakout characters, quotable lines, memes galore, and cosplay. Naturally, it was renewed. How can we possibly keep the magic alive for the show’s infinitely anticipated second season? Easy: STOP TALKING ABOUT IT. A big part of Stranger Things’ appeal was that it basically appeared out of nowhere, without much hype, and became a must-watch based on word-of-mouth reviews among friends. (Lightning struck twice for Netflix, since the same thing happened with Making a Murderer.) The few things that early viewers knew about Stranger Things were: Winona Ryder was in it, and it appeared to owe a serious debt to the 1980s-era works of Steven Spielberg and Stephen King. I actually remember discussing the show with my co-workers, wondering if it would have enough io9 type elements—you know, like a rampaging Demogorgon—for us to cover it here. Now the love for the series is so great that there hasn’t even been much backlash, aside from a few inevitable shrugs at the height of Stranger Things fever. Even with its overt layers of nostalgia, it’s well-made and enjoyable—and it’s impossible not to root for the cast, especially the kids. The eight-episode structure was perfectly paced, allowing the story the exact amount of time it needed to unfold. That’s about a hundred times more info than we had before Stranger Things initially premiered, and it’s also all I care to know about season two—other than exactly when in 2017 the thing will be available for binge-watching. And I hope that’s all that Netflix or anyone is allowed to reveal. The more we know about what to expect, the less we’ll be surprised—and amazed—when the show returns. The mystery, and that thrill of discovery, were huge parts of what made season one so special. I’m genuinely worried about the next several months (or however long it takes until the second season premiere) being a steady stream of information about what to expect, who’s coming, who’s returning, what will happen... everything. This may sound weird coming from a website that will inevitably cover whatever Stranger Things news Netflix provides over the next several months. I may not want to know these things, but I understand it’s io9's duty to report it, and of course we will. What I’m hoping is that Netflix realizes when it comes to Stranger Things season two, less is more—way more. Stop the PR machine now. Keep quiet. Don’t give us or any other site reason to report on the new season, and preserve that sense of mystery for the fans. It’s not like people are going to suddenly forget the show exists, or how badly they’re dying for more. But again, the less we all know about what’s coming, the more we’ll all enjoy it when it finally arrives. But the fans are going to need to pitch in, too. We need to not try to ferret out every single character and plot point before the premiere, and that means no hovering around shooting locations, no going through Netflix’s trash bins, and maybe no cyberstalking all the show’s stars to see if they accidentally drop a hint or two about the upcoming season. In fact, can we please stop speculating right now? I know it’s reasonably benign, and it’s how fans show their love for a series. But what if someone has a theory that Matthew Modine’s enigmatic scientist and Winona Ryder’s poor mom ran the school newspaper together back in high school, and they turn out to be right? I don’t want to be less surprised at one of Stranger Things’ shocking reveals just because someone made a lucky (or even a very well-educated) guess. But hey, keep making those Barb gifs, and by all means get to work on your Eleven Halloween costume. But when it comes to season two, let’s all just agree to take a vow of silence. If we work together, just like the monster-fighting, bully-shaming, pizza-sharing kids of Hawkins, we can do it.